The anti-American leaders of Iran and Zimbabwe met at the UN this week and decided it was high-time they formed a Coalition of Peace. Where Hezbollah and Hamas fit in with this new coalition was not discussed. TEHRAN (Fars News Agency)- The leaders of Iran and Zimbabwe are looking to form a self-styled “coalition for peace”. 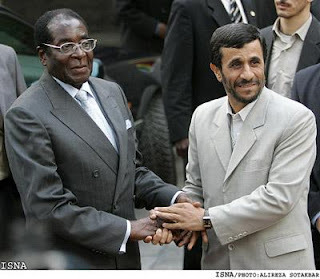 The government in Harare confirmed President Robert Mugabe and his Iranian counterpart Mahmoud Ahmadinejad discussed the formation of such a coalition on the sidelines of the UN General Assembly in New York. “The United States and its allies are so bloodthirsty they don’t want to see peace anywhere in the world,” deputy information minister Bright Matonga told AFP. The Herald newspaper quoted Zimbabwe’s ambassador to the United Nations, Boniface Chidyausiku, as saying Mugabe and Ahmadinejad discussed “areas of mutual interest” in New York. “The leaders also discussed the need to come up with a coalition for peace in response to the aggression of global bullies,” Chidyausiku added. Mugabe has forged new alliances with countries in Asia as well as buttressed ties with traditional US foes such as Cuba and Iran. Commentators saw the idea of a formal alliance among states in the US doghouse as a logical move. Lawyer and political analyst Johannes Tomana said the coalition would work if members are committed to its objectives. “If they are coming together for a common goal and have unity of purpose there is no doubt that it will work,” Tomana said. Augustine Timbe, a commentator for the Chronicle newspaper, said Iran and Zimbabwe “share a common pain inflicted by the West” and should find more countries in similar circumstances to form an effective alliance. The burgeoning alliance between Zimbabwe and Iran has again highlighted the rift between Mugabe and his former Western allies who have imposed sanctions on his government. Matonga argued that events in Iraq meant the United States should be slapped with sanctions. “Bush is the tyrant and a hypocrite for that matter. Look at what he has done to Iraq. There is no functioning government anymore,” he said. “He turns a blind eye to the damage he has caused in Iraq and Afghanistan and now he wants to usurp the powers of the UN and punish those who do not share his thinking. The first act by the Coalition of Peace will be to wipe Israel off the map.